It's been quiet for some time for the UK based Evelyn Records label, but here they return with five new releases as part of their subscription series.... Their subscription series are always five releases at once, sometimes with one or two more well-known people, and some which are new names, so that it becomes a case of helping the new ones. Chefkirk is indeed a well-known name, but perhaps not the cash cow the label needs. 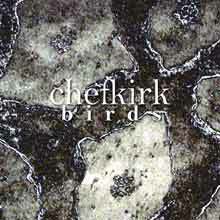 On 'Birds' he offers twelve tracks, which all clock in at a few minutes, so the whole release lasts about forty minutes (which seems to me the average Chefkirk length). Music wise however this not average. It's still the Chefkirk blend of rhythm and noise, but he takes things a bit further away into the area where we can find, say, Pan Sonic: click and cut textured music, with even a bit of silence packed inside. Little bit little Chefkirk is developing himself into a real musician, in stead of a plain noise artist.